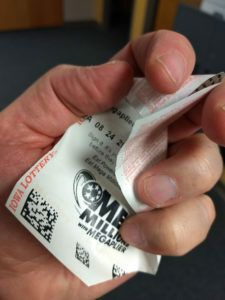 A ticket purchased in South Carolina won the Mega Millions jackpot in Tuesday’s drawing — while the Iowa Lottery says four tickets purchased in Iowa came within one number of getting a share of the prize. The jackpot finished just shy of a world record at $1.54 billion dollars. Iowa Lottery spokesperson, Mary Neubauer, says you should carefully check your ticket before throwing it away to be sure you haven’t won something. “Certainly the jackpots are what get the bulk of the attention in games like Powerball and Mega Millions,” Neubauer says, “but right now here in Iowa there are 52 unclaimed prizes just in the Powerball and Mega Millions games. And those prizes range from $800 up to one million dollars.” One of the near-miss tickets in last nights Mega Millions drawing bought in Davenport is worth one million dollars. Neubauer says the big jackpots bring in a lot of new players who may not be totally familiar with the prizes that are available. “With so many first-time and occasional players being part of the mix — we want to remind people — don’t just check you ticket for the jackpot — check to see all of the prizes that you may’ve won,” Neubauer says. The clock is still ticking on the one-year time period for someone to collect on the one-million dollar prize that hasn’t been claimed. Neubauer says that prize was won back in April in Nevada. “As more and more time goes, unfortunately it becomes more likely that the ticket may’ve been lost or thrown away, and we would hate to see that,” Neubauer says. She says Iowa Lottery players bought more than $5.6 million of Mega Millions tickets for Tuesday’s drawing. That includes a single-day record purchase of nearly $3.3 million in tickets on Tuesday alone.